Ted Macauley first met Mike Hailwood at the Isle of Man TT in 1961 when Mike was just 21 years old and was riding in all four solo classes, becoming the first rider to win three races in a week. 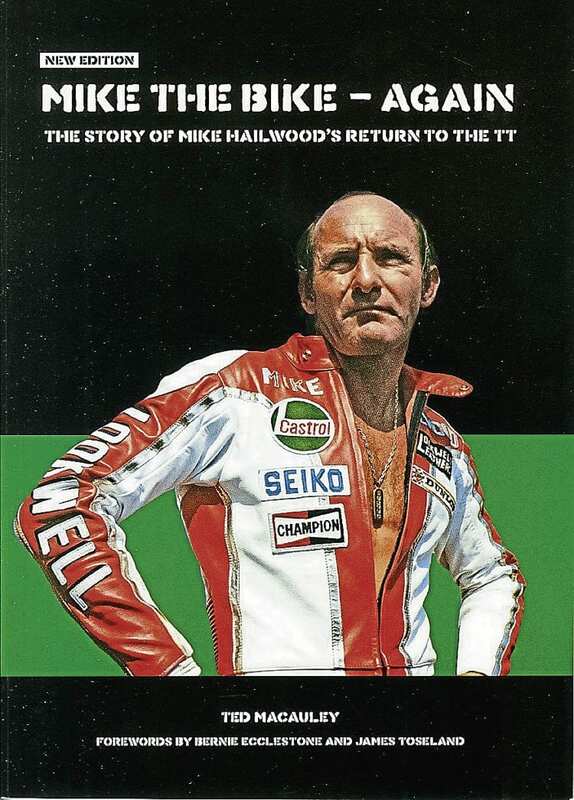 Their friendship flourished, and continued until Mike’s tragic death following a road accident in 1981, and now – 40 years after Hailwood’s stunning TT-winning comeback on a Ducati in 1978 at the age of 38 – Ted, who’s written three books about ‘Mike the Bike’, has completed this timely paperback. With 40 glossy photographs to reflect the anniversary, virtually all of them about Mike’s comeback, the book traces the build-up to the amazing event that drew record crowds to the TT when Mike had just ended an 11-year Formula 1 career. In many ways it’s not the size, weight or plush presentation of any book that matters so much as the actual words inside it – and following glowing forewords by Bernie Ecclestone and James Toseland, Ted Macauley brings the reader as close to the quiet hero’s personality as it’s possible to get in a series of majestic chapters, A Spirit Reborn, Disguised Among the Amateurs, The Bandwagon Begins to Roll, The Hard Way Back, A Frightening Dawn, A Fairy Tale Comes True, Senior Drama, Here We Go Again, The Unforgettable Finale and a truly moving final Postscript about the accident on a Midlands motorway that was no fault of Mike’s yet took both him and his beautiful nine-year-old daughter Michele away from us just over three years after that triumphant TT return. In that final chapter, Ted re-runs an interview he had with Pauline Hailwood after that tragic event that appeared under the headline ‘Life Without Mike’ – and if you are not moved by it, there must be something wrong with you! Fortunately Mike’s legacy lives on in his son David, a familiar figure at motorcycling events all over the country. Mike the Bike – again. By Ted Macauley. Published by Veloce Publishing Ltd, Veloce House, Parkway Farm Business Park, Middle Farm Way, Poundbury, Dorchester DT1 3AR (01305 260068, sales@veloce.co.uk, www.veloce.co.uk). 112-page 210 x 148mm paperback, 40 illustrations, £14.99. ISBN 978-1-787113-13-8. Read more Reviews, Letters, Opinion, News and Views in the September 2018 issue of OBM – on sale now!